19 Jared lived after he fathered Enoch 800 years and had other sons and daughters. 20 Thus all the days of Jared were 962 years, and he died. 26 Methuselah lived after he fathered Lamech 782 years and had other sons and daughters. 27 Thus all the days of Methuselah were 969 years, and he died. 16 Then Cain went away from the presence of the LORD and settled in thelandofNod, east ofEden. 18 To Enoch was born Irad, and Irad fathered Mehujael, and Mehujael fathered Methushael, and Methushael fathered Lamech. 19 And Lamech took two wives. The name of the one was Adah, and the name of the other Zillah. The Enoch whose name is given to three pseudepigraphic books is the Enoch of Genesis 5, who walks with God and, mysteriously, vanishes. The first Book of Enoch is a pentateuchal work, the five books being: the Book of the Watchers, the Similitudes, the Book of Heavenly Luminaries, the Dream Visions and the Epistle of Enoch. It exists only in Ethiopic – the south Semitic Ge’ez language – but Aramaic fragments of 1 Enoch were found at Qumran.Some scholars believe that the original language was Hebrew, others that, like Daniel, it was composed partly in Hebrew and partly in Aramaic. It is usually dated between the third century BCE and the first century CE, during the later period of the secondTemple. Charlesworth describes it as a composite work, with the earliest passages dating from pre-Maccabean times and the latest dating as late a 64 BCE, which is the beginning of the Roman occupation. The presence of fragments of 1 Enoch at Qumran makes it probable that the work originated inJudea. Professor Gabriele Boccaccini of theUniversityofMichiganbelieves that the Enochic community was the same sect as the Essenes of theDead Sea. It is quoted in the New Testament, in the Epistle of Jude. The existing Ethiopic text was translated by scribes of the EthiopicChurch, and there are several references to it in early Patristic literature.After the fourth century CE, it was dropped from Christian use, perhaps because Jerome, who translated the bible into Latin, denied its canonicity, although its influence continued uninterrupted inEthiopia. …1 Enoch is as dependent upon the Old Testament as it is influential on the New Testament and later extracanonical literature. During the exilic and post-exilic periods, apocalyptic became a major trend in Jewish thought. It was inherited by Christianity and remains an element in it to the present. Apocalyptic is both prophetic and revelatory; in apocalyptic literature we find, on the one hand, moral indignation about the present world, and, on the other, the foreboding predictions of eschatalogical events and the ultimate destiny of the world. The second Book of Enoch, in Old Slavonic, is usually dated to the first century CE. The third Book of Enoch, a Kabbalistic text in Hebrew is believed to be written in the fifth century CE. I propose that we defer our study of the second and third books to our next two sessions. Enoch discloses a vision which he received from the angels. At a certain time in the future, God will emerge from heaven and march on Mount Sinai.This will be accompanied by geological catastrophes, arousing fear in both mortals and Watchers (the Enochic term for fallen angels, fathers of the Nephilim, the fallen ones of Genesis 6:4). God will then proceed to judge both the righteous, who will be blessed, and the wicked, who will be destroyed. Enoch speaks about the marriages between the fallen angels and mortal women, referred to in Genesis 6:1-4. He names the leading fallen angel as Semyaz as well as naming other ‘chiefs of tens’ among them. Notable among the fallen angels is Azazel (known to us through the Yom Kippur scapegoat liturgy) who taught the people arts of metallurgy, jewellery making, cosmetics and alchemy. Other angels taught magic – particularly using plants – and astrology. The people were not edified by the knowledge imparted to them by the angels, as it only served to increase their dissipated behaviour. This is the period just before the flood when the wickedness of humanity causes God to repent that He created it,but, in the Enochian version, it is the angels Michael, Surafel and Gabriel who bring these matters to God’s attention. God tells Michael that he should make known to the Watchers and those defiled by them that they will be destroyed while the survivors will become righteous and the earth cleansed from sin and suffering. The fallen angels beg Enoch to intercede for them and he writes down their prayers for forgiveness. He then goes to the foot of mount Hermon and recites the prayers, until he falls asleep. While sleeping, he has a vision which he afterwards recounts to the Watchers. Enoch is then taken on a tour of the earth where he is enabled to see the four winds, the inside of mountains, souls carried by clouds and the path of angels. He is shown a desolate plateau which is the prison for fallen stars and the angel Uriel tells him that the Watchers will be detained there. He learns the names of the archangels – . Uriel, Raphael, Raguel, Michael, Saraqael, Gabriel and Remiel.He is shown Jerusalem, the tree of life and the tree of judgment, strange beasts and finally the three open gates of heaven which he views from the ends of the earth. This is called the Book of the Similitudes, or the Book of Parables. The tone is highly mystical, with descriptions of angels and the secrets of the cosmos. We also find the personification of abstract qualities such as Righteousness and Wisdom, which is familiar to us through the prophetic writings and Wisdom books of the Tanakh. There is an account of the Son of Man, an expression (c’var Enosh) which occurs in the vision of Daniel chapter 7 as ‘one like a son of man’. In 1 Enoch 48, the concept is developed in a way which resembles the Johannine Logos, as a divine being existing before the creation of the world, as well as the Son of Man themes in the synoptic gospels. It has been suggestedbut not widely accepted that 1 Enoch 48 is a later Christian addition (See text 1 Enoch 48) but, as the scholarly consensus is that Enoch predates the NT, it is possible that Enoch is one of the influences on themes developed in the NT. There is a biennial conference called the Enoch Seminar, where scholars of Second Temple Judaism and Christian Origins meet to discuss topics of common interest. At the third Enoch Seminar in 2005, focused on Enoch 48: the Son of Man text. Enoch 51 affirms that Sheol will ‘return all the deposits which she has received’ and the risen dead will be judged by ‘the Elect One’ who ‘stands before the Lord of Spirits’. The concept of the Elect One in Enoch suggests a very un-Jewish dualism. Kings and potentates are to be cast into the abyss by the angels Michael, Raphael, Gabriel and Phanuel.It is interesting that those judged guilty are the earthly powerful elite. Enoch speaks of the role of the angels in the world of politics, when the Parthians and Medes will go to war against Israel, but ultimately turn on each other and be destroyed.Gabriele Boccaccini points out that this reference to the Parthians and Medes ‘…anchors us to a specific event that occured in 40 BCE’, namely an attempted invasion ofJerusalem by the Parthians, who resisted the advance of the Romans from the west. The angels then show Enoch the mysteries of nature and the monsters Leviathan and Behemoth. He sees angels hoisting ropes, which they use to make measurements.What are they measuring? These are the measurements that shall be given to faith and which shall strengthen righteousness. And these measurements shall reveal all the secrets of the depths of the earth, those who have been destroyed in the desert, those who have been devoured by wild beasts, and those who have been eaten by the fish of the sea. So that they all return and find hope in the day of the Elect One. For there is no one who perishes before the Lord of the Spirits, and no one who should perish. Kings and governors will come before God on the day of judgment, and experience pain like a women in labour, a simile often used by the three major prophets, and once by Micah in the minor prophets. Enoch’s grandson Noah is shown the wickedness of men and the imminence of the deluge.Enoch tells Noah that he will be saved and his desendants flourish on earth. The next parashot are visions given to Noah. The angels Michael and Raphael nsme the fallen angels, who corrupted mankind, teaching them warfare and misleading Eve. You, son of man, who art born in righteousness and upon whom righteousness has dwelt, the righteousness of the Antecedent of Time will not forsake you. The third part of 1 Enoch is The Book of Heavenly Luminaries. The angel Uriel shows Enoch the celestial bodies. There are gates through which the sun rises and sets for periods of thirty days, and when the sun reaches the sixth gate, the day becomes longer than the night.The author of these passages has made close astronomical and meteorological observations and draws interesting inferences. And neither does [the sun] diminish…nor take rest but continue to run day and night. As for the intensity of its light, it is sevenfold brighter than that of the moon; nevertheless the sun and the moon are equal in regard to their respective sizes. The author’s idea that both the sun and moon ride on chariots driven by the wind invokes the image of Apollo’s chariot. Uriel instructs Enoch to return to earth for a year so that he can teach his son Methuselah everything he has learned, and in the second year, Enoch will be taken away. Enoch tells Methuselah about the heavenly luminaries, which determine the seasons and the festivals and names the angels, or ‘captains’, to whom God delegates responsibility for the days, months and seasons. 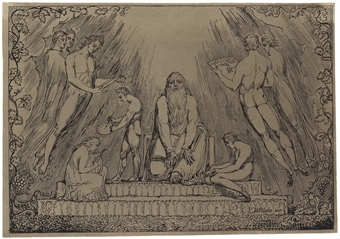 Enoch communicates his visions to his son Methuselah. In the first vision, he sees the earth being destroyed, and prays to God not to destroy life on earth. The second vision takes the form of an allegory of the history from antediluvian times (text of Enoch 85) to the time of the Maccabees. The time of composition may be close to the time that the book of Daniel was written and, certainly, much of the imagery of 1 Enoch resembles the imagery of the apocalyptic passages in Daniel. In Enoch’s dream vision, animals represent human beings (a form of allegory used by Pseudo Philo in Liber Antiquitatum Biblicarum ) and colours represent attributes. Enoch gathers Methuselah and his brothers and addresses them, exhorting them to love righteousness alone. He tells them that violence and plague will break out on the earth. And they shall be removed from the whole earth. Their spirits shall not perish , not their memorial from before the face of the Great One unto all the generations of the world. Enoch tells his children that the righteous should not be afraid when they see the wicked flourish, there will retribution for the wicked and rejoicing for the righteous. Finally, when Enoch finishes his speech, there is a narrative concerning Methuselah and his son Lamech whose wife gave birth to a son of angelic beauty.Lamech begged Methuselah to go to Enoch, now dwelling among the angels, to learn the meaning of this strange portent of the celestial child. The book concludes with the assurance that the righteous will be recompensed for their suffering on earth, and that ‘they shall be resplendant for ages that cannot be numbered’. Much of 1 Enoch is recognizable to those familiar with the Tanakh, especially Genesis, the prophets and Daniel. It contains terminology familiar to readers of the New Testament, and is believed to date from the intertestamental period, which suggests the possibility of an Enochic influence on the gospels. It is in the the third book of Enoch, a Hebrew work attributed pseudepigraphically to the tannaitic Rabbi Ishmael ben Elisha, that Enoch is transformed into the angel Metatron. In the first book of Enoch, he ascends to the heavens and is guided by angels who reveal secrets of heaven and earth, but it is not suggested that he is transfigured into an angel. I suggest that we look at the second and third books of Enoch at our meetings in June and July (2012). Irenaeus, Origen, Tertullian, Clement ofAlexandria.